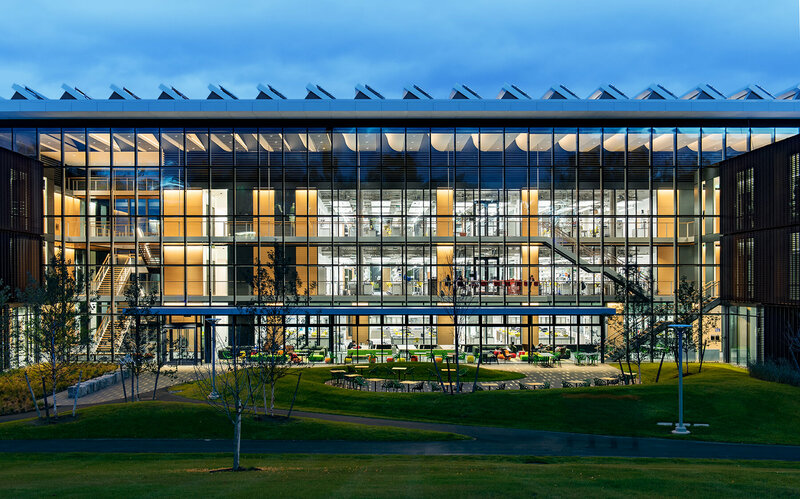 One central goal for the new Science Center at Amherst College was to create a building that promotes interaction among the school’s science departments and connects the sciences to the campus at large. It was essential to integrate the new campus landscape – the Greenway landscape – into the design of the building. The new Greenway landscape, featuring accessible footpaths, gardens, seating and performance areas, re-organizes circulation on the eastern campus, connecting the sciences to the rest of the campus. The landscape includes a café terrace, winter garden and several heritage trees (preserved through construction), which all promotes collaboration. Our design team, in collaboration with Michael Van Valkenburgh Associates, also took into consideration the ecology that would promote an intimate engagement with nature. 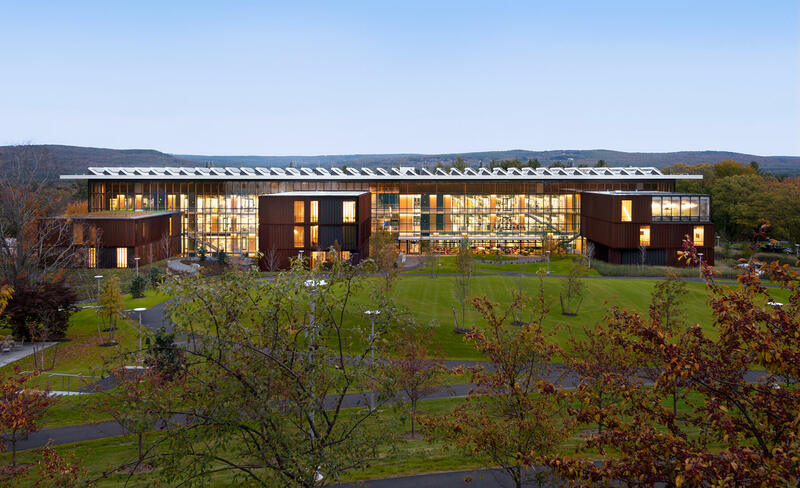 A terraced hillside orchard of cherry and crab apple trees mitigates 40 feet of grade change, blurring the edges of the Common to define the central “living room” for the campus. Reclaimed stone seating nooks and a fire pit create opportunities for small group gatherings. Excavation spoils were used to form a new grass amphitheater for campus-wide events, framed by rolling lawns and informal plantings of deciduous and evergreen trees. 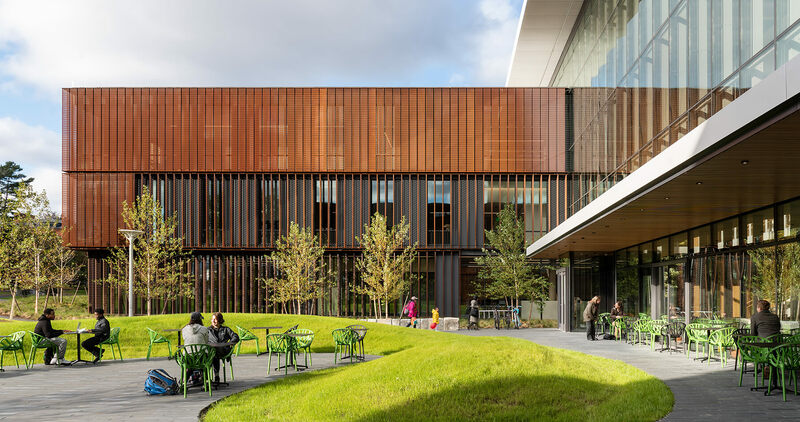 In addition to connecting the campus, the landscape immediately adjacent to the Science Center also reinforces the inside/outside relationship between the building and the site. Most of the activity in the Science Center is visible to the College through the glass walls of the commons. 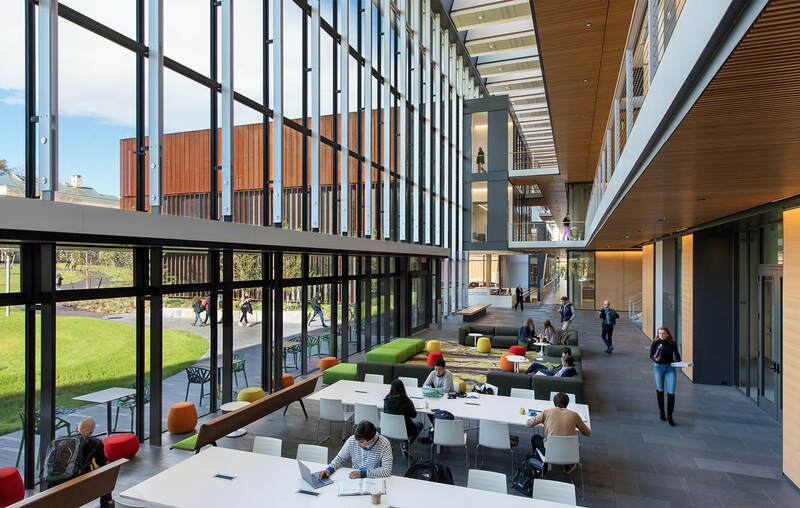 The spaces within enjoy powerful views back to the campus and intimate visual connections to one another. A central gap between the laboratory wings at one end of the Commons offers views to the east, drawing the landscape right into the interior building experience. Prior to the new Science Center, Amherst College President Carolyn “Biddy” Martin described the eastern part of the campus as “just a hill that a few buildings seemed to tumble down.” Now the new Science Center anchors the eastern campus and the Pelham Hills beyond creating a campus “living room” connecting the campus as a whole.